Yes, you can dye brown eggs! Natural dyes work beautifully with organic brown eggs, creating lovely muted colors. 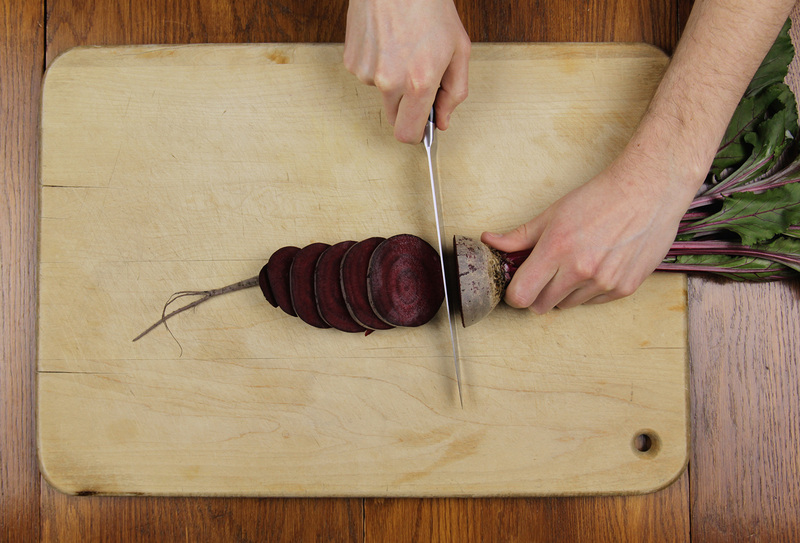 Try natural dyes from beets (pink), turmeric or boiled onion skins (yellow), and boiled red cabbage leaves (blue). BLUE: Put a few red cabbage leaves in a small pot with 1 cup water. Gently boil until the water turns a deep blue. Pour liquid into a bowl and discard the used leaves. 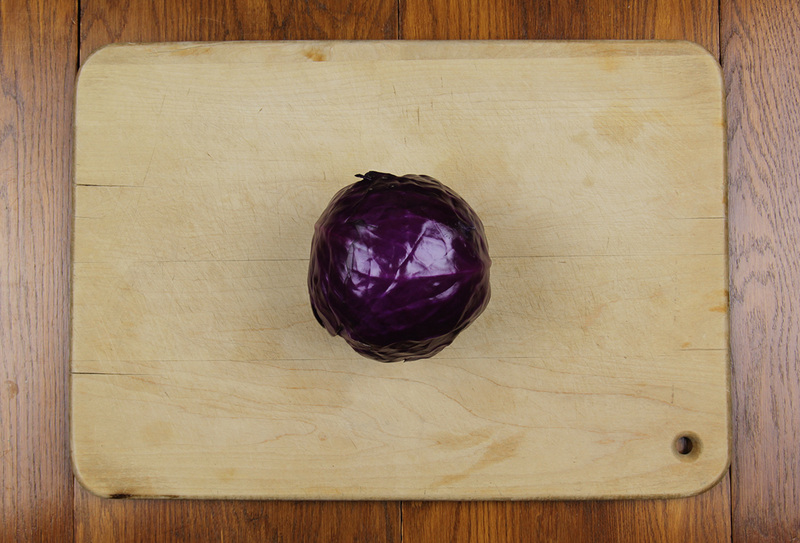 Purple head of cabbage on a cutting board. GOLD: Mix 1 heaping tablespoon of turmeric with 1/2 cup water. Stir to blend. 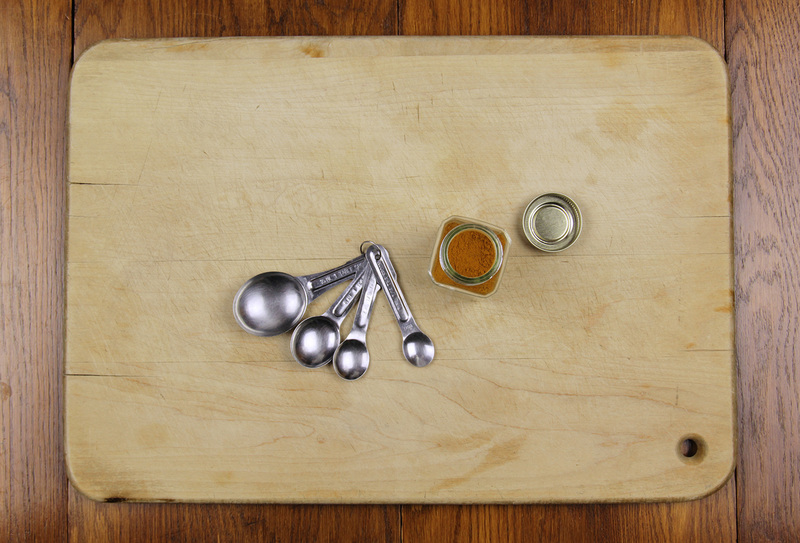 Turmeric powder with measuring spoons on a cutting board. You can also experiment with colorful herbal teas, black tea, coffee, grape juice, spinach, paprika, and even onion skins to get a rainbow of colors! Be sure to wash your hands (and any small hands involved) before handling eggs. 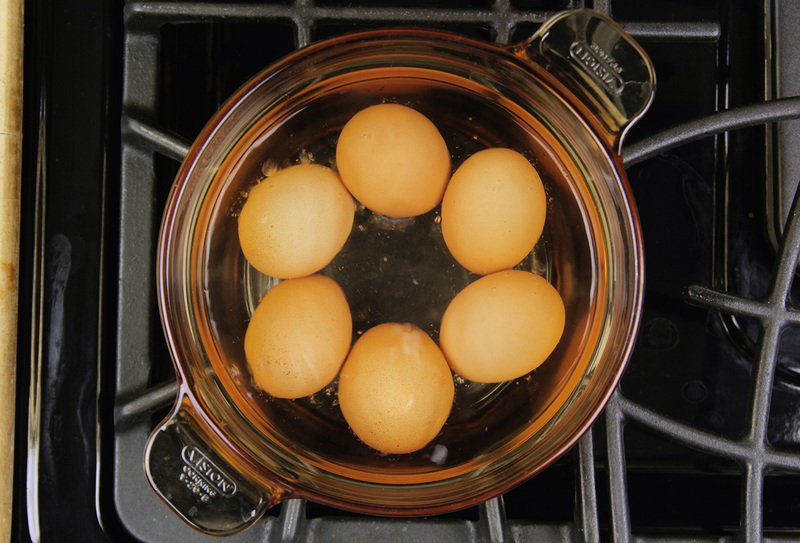 Hard-Boiling: Boil the eggs, remove from hot water, and cool slightly. Rub shells with white vinegar to help the shell take up the dye. Boiled eggs are sturdier for little hands, but they will go bad if left out on display. Always refrigerate hard-boiled eggs after coloring them and eat within 5 days. The USDA advises discarding cooked eggs that have been at room temperature for more than 2 hours. Eggs being hard-boiled on the stovetop. Shells-Only: Alternatively, if you plan to put the eggs out on display, use a fork or skewer to poke small holes in both ends of the egg and gently blow the egg out of the shell into a bowl. (Save to scramble up later!) Rinse the shells very well and allow to dry. Rub shells with white vinegar to help the shell take up the dye. Shells-only is a good option if you plan to display your creations. They're very fragile, though, so this method is best done with older children who will be less likely to crush them. Place eggs in bowls with dye and let sit for several minutes. The longer they sit, the deeper the color penetration. Blot eggs dry with a paper towel and arrange on a festive plate. 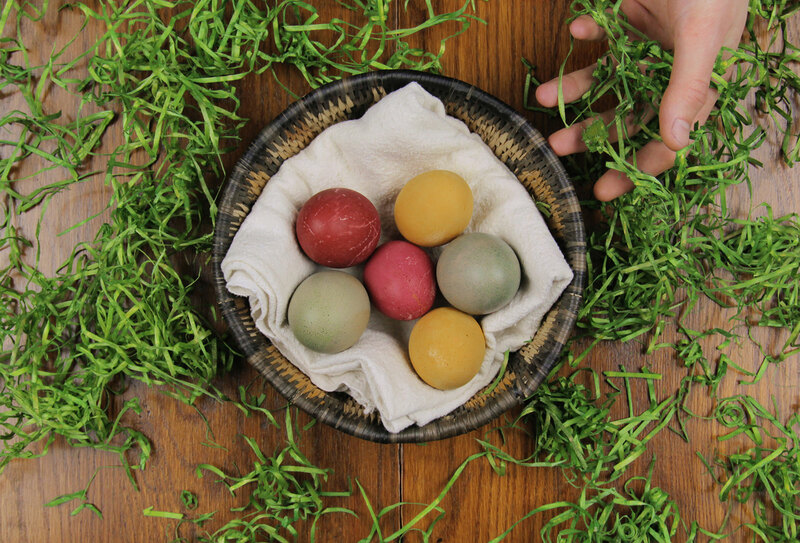 Eggs Sitting in the Natural Dyes. Step up your egg-coloring game by making patterns on the eggs! Draw pictures or write messages with a wax crayon (we recommend white or tan/brown), or apply masking or electrical tape before adding the eggs to the bowls. Then gently remove the tape when eggs are dry. These food-derived natural egg dyes are perfectly safe, but they will stain clothing, carpet and skin. So we recommend wearing old clothes and lining your project area with newspapers or old cloths. Try using bright, reusable, plastic eggs filled with eco-friendly toys and organic treats for children's Easter egg hunts. Hard-cooked eggs may crack, allowing bacteria to enter and grow inside the egg, so the real ones are best enjoyed in the kitchen. 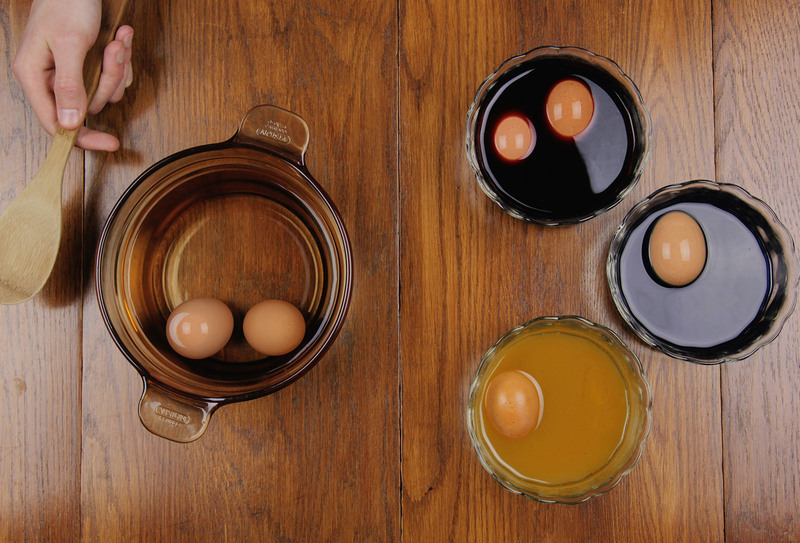 Food-grade egg dyes also work on brown eggs. Try preparing the solutions with less water for strong, rich colors. They will not mask the brown entirely; rather they will blend with the egg's natural color to create a unique, textured look.